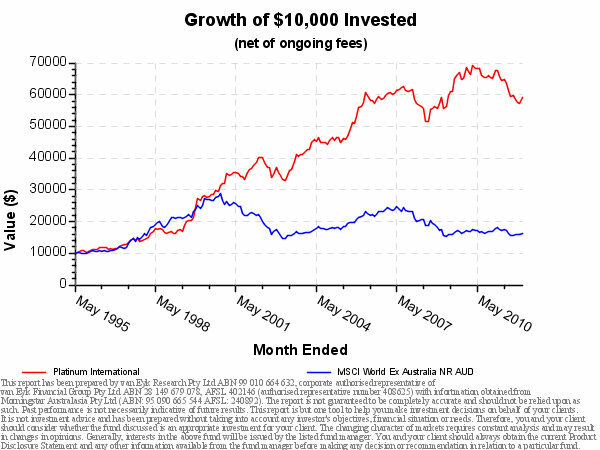 Platinum Asset Management is undoubtedly the most successful International shares manager in Australia. Their long term performance is way above global benchmarks and thanks to this, their support has been unwavering and they have grown and grown to be one of Australia’s largest fund managers with over $18 billion in FUM. …its a pity they didn’t attribute that priority to whoever sets their fund’s pricing. Sure their performance is pretty good as the performance of the Platinum Internation Fund demostrates below. But when you earn Profit before tax of $213m on Revenues of $264m (or a gross profit margin of 81%!!! ), something tells me they may be a little greedy. so overall I’m really struggling to believe that their fund investors are a high priority. Whilst profit margins are 81% for shareholders, despite their benchmark relative strong performance…their investor clients can’t claim profit margins anything like it…and never will. Given the staff also own a lot of Platinum stock I’m fairly confident failure to perform in the future shouldn’t worry them too much financially and the stickiness of the funds in Platinum is likely that profitability will never be threatened. Which is not necessarily a bad thing, but surely there comes a point when its time to give back to those who have supported you for so long. So…I know this is a big call as many advisers and their clients are very very loyal to Platinum, but perhaps there are some other global fund managers out there that may be a little hungrier and fairer to their client investors. Perhaps its time to change.